With legal marijuana now available in so many states for medicinal and recreation purposes, there is a growing interest in the ways that marijuana can be used. As you begin to research options, you're sure to run into the term "vaporizer", and if you're like many people, you might not know what it means. What is a Vaporizer? This article is a brief introduction to just what a vaporizer is and how it stacks up to smoking. The material to be vaped is placed inside of the vaporizer. The inside of the vaporizer gets hot. The heat can come from a lighter held up to the vaporizer, from butane mixing with air inside the vaporizer or from a heating coil that is powered by a battery or electricity. As the inside of the vaporizer gets hot, it heats up the material. The material eventually reaches a temperature called its vaporization point. At this temperature, the active natural chemicals inside of it are turned into a gas. The gas from the substance, called vapor, builds up inside of the vaporizer. The user typically draws the vapor into his or her lungs through some type of mouthpiece. Sometimes the vapor may be released into the room to scent the air. This use is called aromatherapy. Smoking involves combustion. The material that you're using catches on fire. This heats it up quickly and releases the active chemicals along with carbon from the fire. Check out our conduction vs convection informational page. Vaporizing involves creating gas, or vapor. There is no smoke involved and no carbon released with the active compounds. Vapor produced from vaporizers does not contain the carcinogens found in smoke. 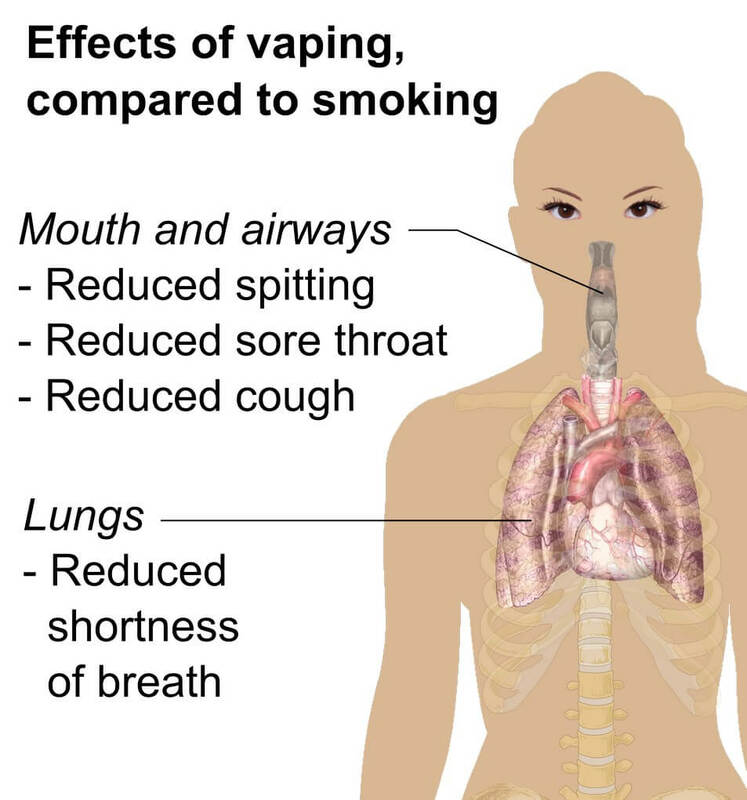 This leads many scientists to believe that vapor is not as likely to cause cancer. Vapor produced from vaporizers is cleaner than smoke. This leads to speculation that it is gentler to the lungs and airways, less likely to cause irritation, and less likely to cause lung diseases and problems than smoking. Vapor produced from vaporizers does not leave behind a burned smell on hands, breath, or clothing. Often times, you cannot even tell if someone is vaporizing around you based on smell alone. If you'd like to learn more about vaporizers, you can check out our other informative articles. Want to try a vaporizer? We can help you select the perfect one. Contact us for assistance. Vaping vs Smoking: Which is Better For You? I have been vaping for about 6 months after smoking for 21 years. At first, I was really unsure about it. The idea of having to fill up an e-cigarette and charge batteries and everything else seemed like so much work, and I was worried I'd have withdrawal symptoms from quitting. Truth is, I didn't have any problems. I only have to charge my vape battery every other day and fill it up about once per day. The flavored e-juice is so much tastier than smoke, and I have been breathing better and feeling more energetic without the urge for a cigarette at all. All this looks very promising for those who are trying to quit smoking and for people who have to smoke medical marijuana. I have not done any research, so from my point of view only time will tell if vaporizing is less harmful to the lungs and airways. It would be great if it turns out to be a safer alternative. I’m looking to buy my first vape soon and hopefully I’ll be able to cut on smoking. I’ve smoked for the last 10 years, even one pack a day, and I’m afraid if I keep this going I’ll mess up my lungs even more. I have completely switched from smoking dry herbs to now only vaporizing, it taste much better, full flavor and no waste of thc. Thanks for the help bud! I thought I had heard on the news the other day that a certain agency or group of people are trying to ban vaporizing, or was it vaping? I believe because they say it's just as bad, if not, worse than actual smoking? Or, that could just be our government at work again. Either way, I'm all for it, due to the fact that it cuts down on the smoke odor smell you get everywhere, and it has to be healthier alternative, since there is no combustion. I know that there are still studies being done to conclude exactly what the risks and/or benefits of vaporizing are... As a former smoker who has turned to vaporizing, I can tell you that I definitely FEEL better since I ditched the cigarettes in favor of my vaporizer. I hear the phrase "cleaner smoke" thrown around a lot, and I absolutely agree with that. There are no lingering foul smells or tastes. Couple that with the fact that I've been able to completely quit smoking cigarettes, and I am a huge supporter of turning to vaporizers.